The Recreational Vehicle industry is going green using new high-tech materials, referred to as composites or earth-friendly materials. For decades the materials used to build RVs have been wood or metal framing, fiberglass or aluminum skin, polystyrene or fiberglass insulation, and lots of wood in walls, floors and ceilings. These materials work fine, as long as they’re assembled with care and craftsmanship. Wood has always been a love/hate material for RVs. It’s cheap, can be lightweight and durable, which means low-cost on the manufacturing assembly line. It also rots, and since water leaks are a main cause of damage to RVs, wood is also the cause of costly RV repair bills and loss of resale value. We’ve seen RV construction material advances over the decades, but it’s not until the last few years that some RV manufacturers have fully embraced new materials and construction techniques. Wood and other traditional materials are cheap to use, while new-age composites are not. Adding cost to an RV has always been unpopular, regardless of how good a job the higher-priced hardware does. And given the current economic climate, price is more important than ever. What does the buyer stand to gain by choosing a more-costly RV built to the new standards? Most of these RVs are lighter weight, which saves fuel and can help with more-comfortable towing. Visually, the new composite RVs are stunning and bear little resemblance to the RVs of yesteryear. There’s also the satisfaction of knowing your RV is better for the environment in that recyclability is a big plus for most composite-built RVs. Our featured trailer is from Earthbound RV (www.earthboundrv.com), a company that’s at the forefront of new-thinking RV construction. 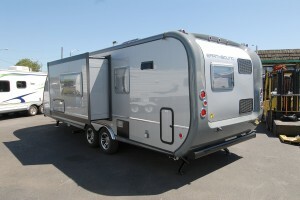 The model pictured is a Golden Ridge RKS, a 29-foot 6-inch model that weighs 4,735 pounds dry (be sure to add water, propane, option and estimated cargo weights when examining an RV’s weight figure) and is outfitted with the usual full self-containment features and living space accommodations. Estimated starting price is about $44,500. A material called Cosmo-lite, a sheet plastic-like material that’s packaged in seamless rolls, is a significant factor in this trailer’s construction. 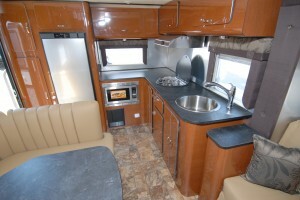 There is almost no wood in this entire RV, with the exception of a few minor components. The sidewalls are laminated with a smooth aluminum skin, Cosmo-lite backer (replaces luan plywood), aluminum framing and polystyrene insulation and a Cosmo-lite interior skin (also replaces luan plywood material). There’s no formaldehyde in Cosmo-lite so it’s safer for your health. This assembly, the roof and floor units are vacuum-bonded using moisture-cured urethane adhesives. No part of these assemblies can absorb water or be damaged by unintended water intrusion. The lack of water-absorption also means areas like storage compartments, typically occupied by hoses, leveling blocks and other RVing essentials that may be wet from being outside, won’t suffer from long-term repeated exposure to moisture. Inside, most RVs with wood cabinets are restrained to units built of typical flat panel components. The higher-tech composites are far more flexible in design possibilities so curved, flowing surfaces can be integrated in the cabinet elements. Earthbound employs aluminum-skinned cabinets with a high-gloss laminate finish and non-wood structural panels and there’s no formaldehyde in these assemblies. The result, combined with the plush upholstery and metal-panel accents, looks more like a luxury yacht or aircraft interior than an RV. This entry was posted in Rely on the Auto Experts -- Motor Matters Reviews, Rolling Homes. Bookmark the permalink.